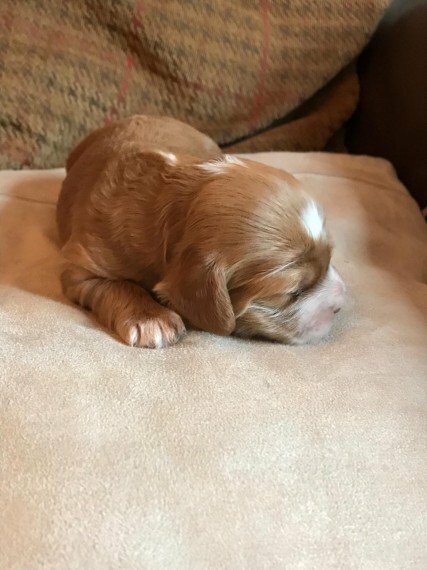 We have a beautiful litter of the highest quality F1 Cockapoo puppies. They have beautiful colours and markings. 1 Black Girl 1 Sable Boy . Reserved 1 Chocolate Girl 3 Red Girls These puppies will make ideal family pets or companions and will have been handled and socialised from birth. Both Mum and Dad have wonderful natures and this has ensured we have happy. healthy and well nurtured puppies. The Mother is our beautiful chocolate KC Registered show type Cocker Spaniel. she is very loving and affectionate. The Father is Harley a very well known and highly sought after Cream Miniature Poodle stud boy. He..s known for producing stunning quality puppies and has sired a number of puppies that have gone to celebrity homes. He is also one of the most extensively health tested stud dogs in the country and has a clear result for all his tests. This guarantees that your puppy will never develop any of these terrible problems. Harley is a stunning looking KC Registered dog with the most wonderful loving nature. Harley..s health tests are Progressive Retinal Atrophy .prod.PRA. eye test . clear. Famillial Nephropathy .FN.. . clear. Von Willebrand Disease .vWD.1. . clear. Macrothrobocytopenia .MTC.D. . clear. Malignant Hyperthermia .MH. .clear. Degenerative Myelopathy .. . clear. Your puppy will be homed having a full veterinary health check. 1st injections. microchipping. worm treatments to date. flea treatments to date. healthcare card. four weeks free insurance. a blanket .smelling of mum to help overcome any anxiety in the first few days.. some pet food and their favourite toy. A 200 non refundable deposit reserves you pup. Puppies will be ready to leave on Sunday 9th December. If you have any questions please give us a call or send a message.